Team Chevy released a rendering and teaser video this morning for the upcoming Camaro GT4.R race car. 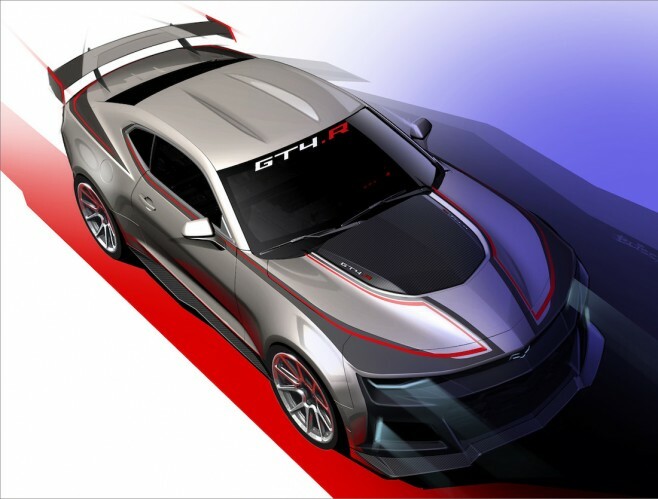 With Ford, Porsche, and McLaren competing in various GT4 series, and with Mercedes and BMW soon to join as well, Chevrolet will jump into the fray with its Camaro GT4.R! It will be powered by a ace-spec version of the Camaro SS’s 6.2-liter V8, connected to a six-speed sequential gearbox made by Xtrac. Pratt & Miller, the racing firm that develops Chevy’s Corvette race cars, is helping out with the engineering work on the Camaro GT4.R. To generate downforce, the GT4.R uses a new rear wing and a new splitter and dive planes at the front. In addition to the gearbox, Xtrac provided the GT4.R’s limited-slip rear differential and traction control system. The dampers are adjustable coilover units from Ohlins, and the adjustable ABS braking system is from Brembo.